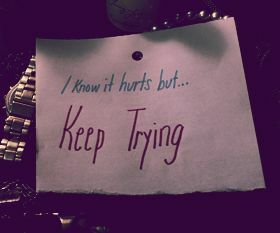 In order to succeed in our lives we have to be able to keep trying. Though there are many times when it may be simple enough to just say that we want to stop going, and that achievement of our goals and our dreams is impossible, if we just keep trying we will make it to where we truly want to be. If we refuse to keep trying then we refuse to make it to the places that we really want to be in life. If we keep trying and we persevere through the hard times, the good times, and the achievements that we will receive for doing so will be that much more worth it. Never let something get you down, and stop your forward progress just because it looks too difficult to overcome, keep trying, and keep hoping, and soon enough you will be where you need to be.